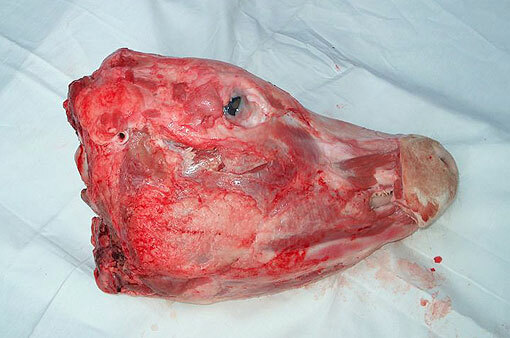 AFC - 10/16/03 Did Your Hamburger Have a Face? On Thursday, October 16, on the World anti-McDonald's Day, Animal Friends will organize a public action against this multinational company accused of crimes on animals, huge economical damages, using children as workers, manipulation with children, serving unhealthy food and for supporting hunger in the world. 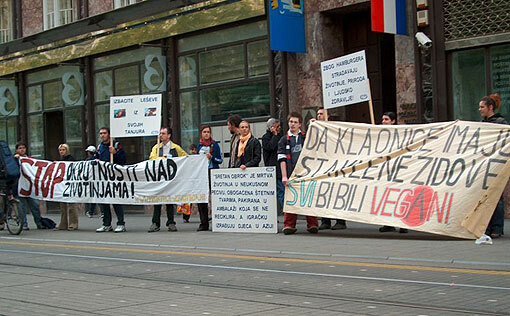 The action will take place on October 16 at 12 in front of McDonald's in Jurisiceva ulica in Zagreb. 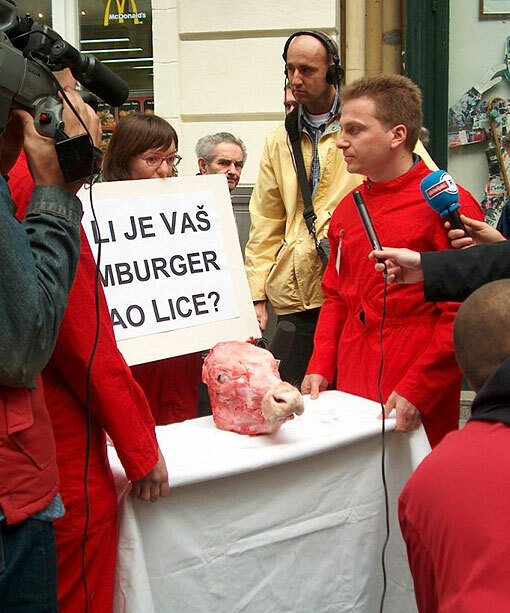 Besides the leaflets and billboards, the activists will also bring a piece of cow's corpse to "remind" the citizens that hamburgers don't grow on trees, but that they had their bodies, their faces and their eyes. 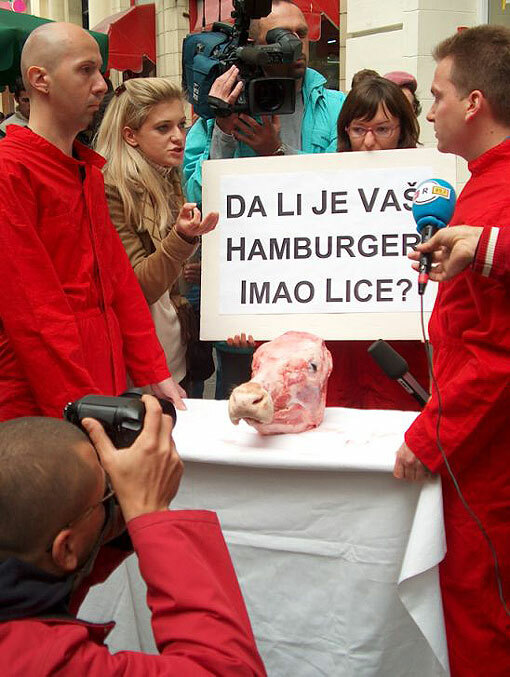 For what that world famous, biggest fast food company, the concept for the hamburgers has its "anti" day? The answer is simple-McDonald's is responsible for the death of millions of animals every year, for its bad treatment and brutal slaughter. There is a direct connection (which they admit) of McDonald's and destroying rainforests. Clearing up rainforests causes the disappearance of many animals and plants, chasing away the inhabitants and the burning causes global warming. Every year large surfaces of forests disappear for the purpose of meat industry, whose beneficiary is always McDonald's. McDonald's favorite target groups are children. The manipulation with children is one of the biggest problems with the company. Commercials meant for children draw them to the restaurants in that "magical circle," which is actually passed from parents on their children, then on the children's children, and, in doing so, creating the exact "magical circle." The biggest bate are cartoons, toys, clowns, balloons, and everything which can be used as an attraction. Parents are only the financial support. At the same time McDonald's itself admits that those toys meant for children in the restaurants are made by children workers in poor countries. That much about their real love and concern about children. It is amazing how ordinary restaurant which offers unhealthy food, without any educational background, is able to convince the entire public that children are crazy about visiting it and that they "enjoy" its un-tasty and unhealthy food of low nutritional value. This case of McDonald's just shows the power of financially strong marketing campaign. Considering that October 16 is also World Day of Food we want to highlight the issues of world hunger and unfair exploit of natural resources.